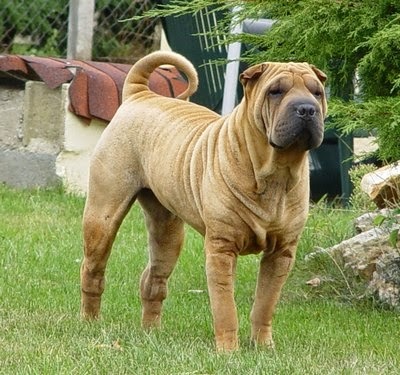 The shar-pei is a compact dog of medium size, square in profile with a well proportioned head slightly but not overly large for the body. It has a harsh coat and loose skin. Calm, independent, affectionate, aloof, loves company. Large in proportion to the body, a flat skull,broad,moderate stop. Length from nose to stop approximately equal to length from stop to occiput.Fine wrinkles on top of the head tapering down the muzzle. Muzzle broad and full with no tapering. The lips and top of the muzzle well padded, causing a slight bulge at the base of nose. Bottom jaw appears wider than the top due to padding of lips, nose large and wide. Dark, medium size almond shaped with a frowning expression. Amber and lighter colours permissible in paler coated dogs. Free from entropion. Medium length, strong full set well on shoulders with loose skin under the neck. Rounded, narrowing to a fine point. Base set very high. May be carried high and curved, carried in a tight curl or curved over. Muscular shoulders, well laid and sloping, elbows close to body. Forelegs straight moderate length, good bone, pasterns slightly sloping, strong and flexible. Muscular strong, hocks without excessive wrinkle. Moderate size, compact, toes wellknuckled.Fore and hind dewclaws may be removed. Extremely harsh straight and off standing on the body but flatter on the limbs.No undercoat.There are three coat types horsecoat which is extremely short and may give you a rash if rubbed against, brush coat which varies from around half inch to inch. Bear coat which is much longer giving the appearance of a chow chow, and this coat is not to breed standard although does look very nice. Tongue, roof of mouth, gums and flews solid bluish black. Pink or spotted tongue is undesirable. Dogs with self coloured pigment and amber or light eyes would have a lavender tongue. Teeth strong with a perfect regular scissor bite ie, upper teeth closely overlapping lower teeth and set square to the jaw. Padding of lower lip should not be so excessive so as to interfere with the bite. Free, vigorous and balanced, rear single tracking is normal at fast trot. All solid colours, black and various shades of fawn more desirable for the show ring. Males to have two apparently normal descended testicles.